Treat dry, irritated feet to the AHAVA Dermud Intensive Foot Cream; a rich, ultra-nourishing formula that utilises Dead Sea minerals to soften and repair cracked and rough skin. Harnessing the powers of Aloe Vera and Shea Butter, the soothing cream repairs and renews feet, whilst a nourishing blend of Coconut and Jojoba Oils infuse feet with long-lasting moisture. Antioxidant Vitamin E defends against environmental damage and harsh climates, leaving skin comforted and conditioned from heel to toe. Aqua (Mineral Spring Water), Glycerin, Butyrospermum Parkii (Shea Butter), Ceteareth-20 & Cetearyl Alcohol, Simmondsia Chinensis (Jojoba) Seed Oil, Ethylhexyl Palmitate, Sodium Lactate, Propanediol (Corn derived Glycol), Cocos Nucifera (Coconut) Oil, Decyl Oleate, Glyceryl Stearate, Aloe Barbadensis Leaf Extract & Aqua (Water) & Propylene Glycol, Peg-40 Stearate, Stearyl Alcohol, Lactic Acid, Maris Aqua(Dead Sea Water), Xanthan Gum, Panthenol (Pro Vitamin B5), Zinc Oxide, Parfum (Fragrance), Silt (Dead Sea Mud), Allantoin, Tocopheryl (Vitamin E) Acetate, Iodopropynyl Butylcarbamate & PEG-4 Laurate & PEG-4 Dilaurate & PEG-4, Hippophae Rhamnoides (Oblipicha) Fruit Oil, Lavandula Angustifolia (Lavender) Oil, Methylisothiazolinone, Tocopherol (Vitamin E), Hexyl Cinnamal, Linalool, Alpha Isomethyl Ionone, Benzyl Salicylate, Hydroxyisohexyl 3-Cyclohexene Carboxaldehyde, Geraniol, Coumarin, Benzyl Benzoate, Cinnamyl Alcohol, Limonene. 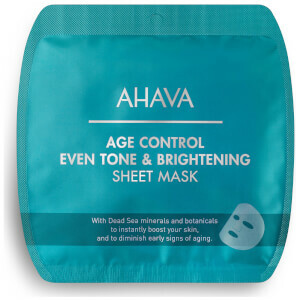 Save 10% off AHAVA and receive a free AHAVA Age Control Even Tone & Brightening Sheet Mask x 2 when you spend $50 on the brand. Gift added automatically at checkout. While stocks last.